I've been learning about Geographical Information System (GIS) data lately. More and more projects and businesses are doing interesting things by associating new kinds of data with specific latitude/longitude pairs; this data might be about air quality, real estate prices, or the make and model of the nearest Uber car. DBpedia has a lot of latitude and longitude data, and SPARQL queries let you associate it with other data. Because you can retrieve these query results as CSV files, and many GIS packages can read CSV data, you can do a lot of similar interesting things yourself. A query of DBpedia data about American astronauts shows that the oldest one was born in 1918 and the youngest one was born in 1979. I wondered whether, over time, there were any patterns in what part of the country they came from, and I managed to combine a DBpedia SPARQL query with an open-source GIS visualization package to create the map shown here. QGIS Desktop is an open-source tool for working with GIS data that, among other things, lets you visualize data. 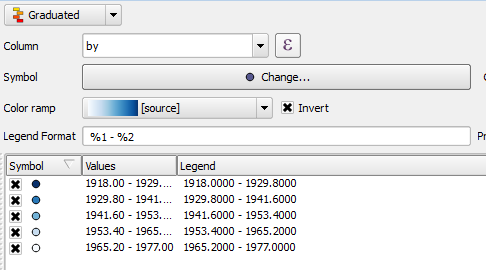 The data can come from disk files or from several other sources, including the PostGIS add-on to the PostgreSQL database, which lets you scale up pretty far in the amount of data you can work with. Using QGIS to create the image above, I first loaded the shapefile (actually a collection of files, including an old-fashioned dBase dbf file) from the US Census website with outlines of the individual states of the United States. GIS visualization is often about layering of data such as state boundaries, altitude data, and roads to see the combined effects; those little cars in your phone's Uber app would like kind of silly if the roads and your current location weren't shown with them. For my experiment, the census shapefile was my first layer, and QGIS Desktop's "Add Delimited Text Layer" feature let me add the results of my SPARQL query about astronaut data as another layer. One tricky bit for us GIS novices is that these tools usually ask you to specify a Coordinate Reference System for any set of data, typically as an EPSG number, and there are a lot of those out there. I used EPSG 4269. 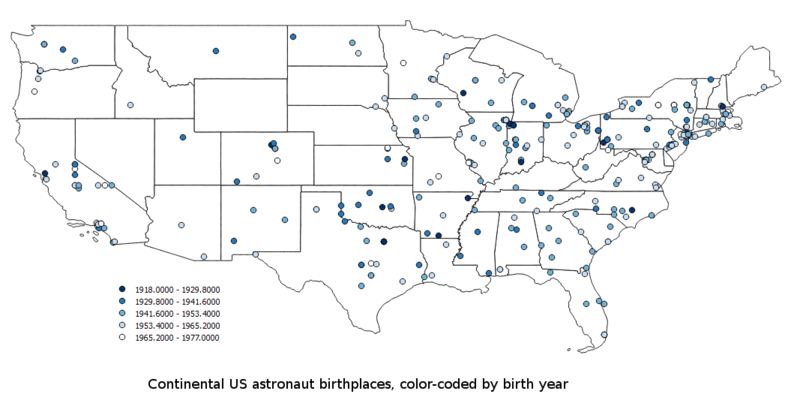 If you click on the map above to see the larger image, you'll see that many early astronauts came from the midwest, and then over time, they gradually came from the four corners of the continental US. Why so many from the New York City area and none from Wyoming? Is there something in New York more conducive to producing astronauts than the wide-open spaces of Wyoming? Yes: there are more people there, so the odds are that more astronauts will come from there. See this excellent xkcd cartoon for more on this principle. ?object spatial:nearby(40.712700 -74.005898 10 'mi'). (The data uses a fairly broad definition of "airport," including heliports and seaplane bases.) I have not played with any GeoSPARQL implementations outside of geosparql.org, but the Parliament one mentioned on the GeoSPARQL wikipedia page looks interesting. I have not played much with the Linked Open Streeet Map SPARQL endpoint, but it also looks great for people who interested in GIS and SPARQL. Whether you try out GeoSPARQL or not, when you take DBpedia's ability to associate such a broad range of data with geographic coordinates, and you combine that with the ability of GIS visualization tools like QGIS to work with that data (especially the ability to visualize the associated data—in my case, the color coding of astronaut birth years), you have a vast new category of cool things you can do with SPARQL.